Wood pallets are used in lots of DIY woodworking projects like dressers, wine racks, and bookshelves because they’re usually free to obtain and can work for many different projects to create something unique. Check out these free pallet plans to see what I mean. But how do you get free wooden pallets? Is there a store you can visit them just hands them over? There probably aren’t outlets setup just for giving away wooden pallets, but there are plenty of businesses and maybe some individuals that dispose of them because they have no use for them. Below are some tips and things to remember when looking for free wooden pallets. Many of these same tips can be used when looking for free lumber. Large businesses may order lots of supplies, and most or all of the shipments may come on wooden pallets. While this sounds like a great opportunity for you to jump in and snag a few dozen or more for your woodworking projects, it probably won’t work. Bigger companies likely already have steps they take to get rid of their unnecessary pallets. A third-party company may come on a schedule to collect and dispose of the waste. The alternative is to seek out small companies. Due either to a lack of budget for a hauling company or because they don’t have the time or other resources to do it, they probably just toss their pallets into the dumpster. They may even lay them out next to the dumpsters so that trash services can pick them up. Some companies that may use pallets include hardware stores, small garden shops, equipment stores, newspaper companies, pet stores, grocery stores, and the like. Striking a deal with the workers/managers of a construction site may be another ideal place to look for free pallets. Note: Keep in mind, though, that pallets leaned up against a wall or even sitting next to trash receptacles may not be free for the taking. They probably are, but it’s important to ask just to be safe. If a small company needs to dispose of their pallets, and you’re in need of pallets, the math should be easy: get free pallets while at the same time helping a small business clean up their waste; be the “trash/pickup service” they’re in need of. If you know of some local places that are constantly getting rid of pallets, simply ask them if you can take the load from them. If they’re already paying someone to do it, you could always offer to take the pallets at no cost because you like to use them for DIY projects. Any excess you don’t use could then be given to someone else that needs them or taken to a dump area. This type of relationship may transform into something even bigger. They may eventually contact you if they end up having other kinds of waste that you could use for your at-home projects. If the company receiving the pallets won't hand them over, you can try working directly with the distribution center that's shipping out the pallets. They may have tons of pallets that don't work with their machinery, are slightly broken, or don't agree with a standard they require in order to use them. Simply ask them if they can set them aside for you to pick up. Also look out for pallet recycling companies. They might be able to give away some pallets to you for free if not for a small fee. A good way to find free wood pallets is to form a relationship with individuals that are either looking for pallets (and you can work together) or that have excess that you could take from them. Placing an ad on a website like Craigslist is a good start. You can advertise anything you want to get rid of, so long as someone else can provide you with free or cheap pallets. Facebook and other social media sites can be just as helpful as well as the freebie finding website Freecycle. The website 1001 Pallets has a classified ad section that allows you to look for free pallets in your local area. Businesses or individuals that would like to get rid of their pallets will often post here as well as people like you who are looking for pallets. Something to think about when doing this is that you could make a clean trade. If you have excess stone, unused lumber, garden seeds, or literally anything else that someone may want, you may very well be able to trade them for some free pallets. Otherwise, someone may just be wanting their pallets picked up and removed, in which case you can take them and use them for yourself. While you're picking up some wood pallets for your own DIY projects, consider picking up some extras. 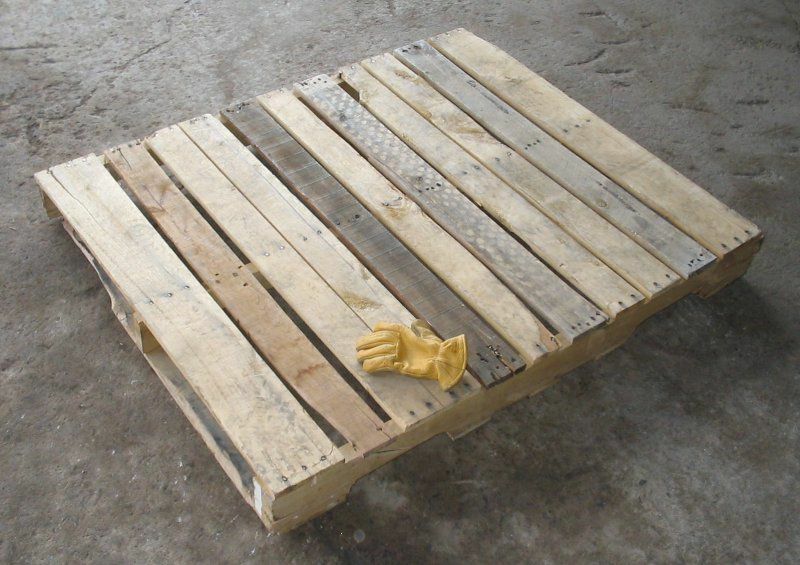 Here are some tips on how to make money reselling pallets.